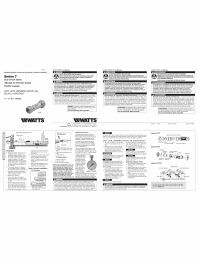 Watts LF7R Series Dual Check Valves prevent the reverse flow of polluted water from entering into the drinking water supply at the service entrance or at individual outlets. They are designed for non-health hazard residential water system containment and continuous pressure applications. 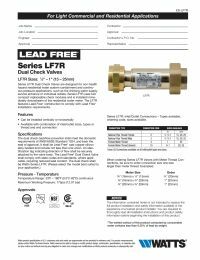 The valves consist of a Lead Free cast copper silicon alloy body construction, with two compact replaceable plastic check modules, and stainless steel springs. They are installed immediately downstream of the residential water meter, in a vertical or horizontal position. Check with local inspection authorities for installation requirements.